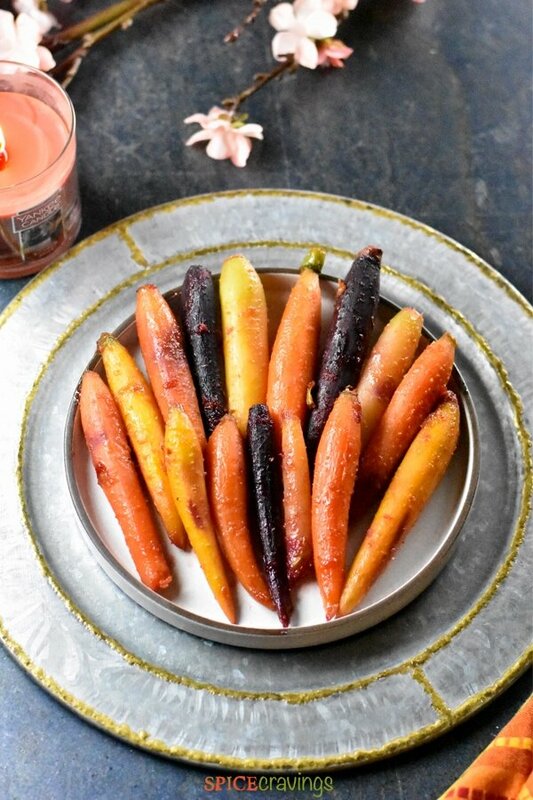 These crisp, tender and citrusy-sweet Honey Glazed Carrots are a delicious and colorful side, fit for any occasion. This recipe is quick and easy to elevate weeknight dinners, and elegant enough to compliment any festive occasion. Perfectly steamed carrots are sautéed in ginger infused orange juice, till they form a sweet floral glaze all over. Orange juice and zest add a subtle citrus flavor, which contrasts so beautifully with the ginger. This is one of my favorite ways to eat carrots! This is a really easy recipe that takes a total of about 15 minutes, and most of that time is hands-free. 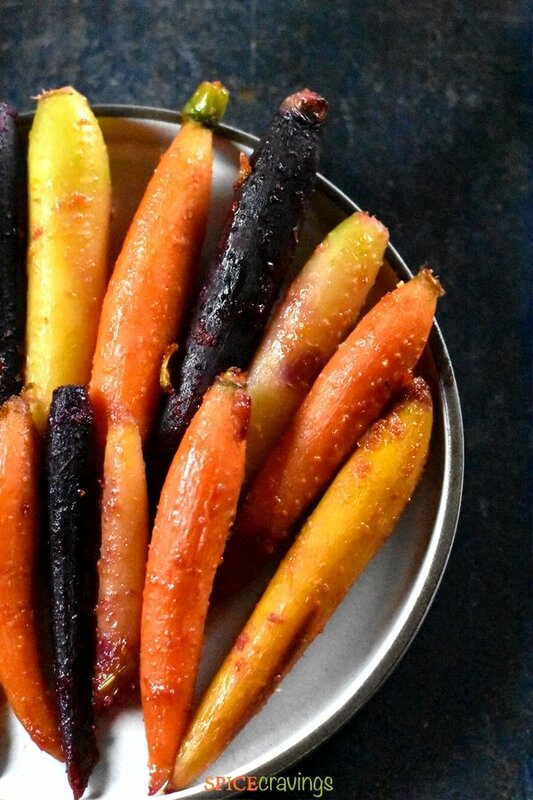 In this post, I’ll show you how to make these glazed carrots in your electric pressure cooker, Instant Pot, or on the stove. If you’re looking for Vegan Thanksgiving sides, or do not wish to use honey for any reason, you can substitute the honey for maple syrup and enjoy Maple Glazed Carrots with your meal instead. 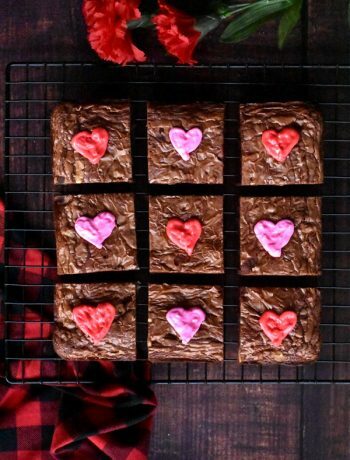 Simply follow the same recipe instructions. 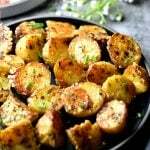 This recipe is very versatile and can be used with any kind of carrots. 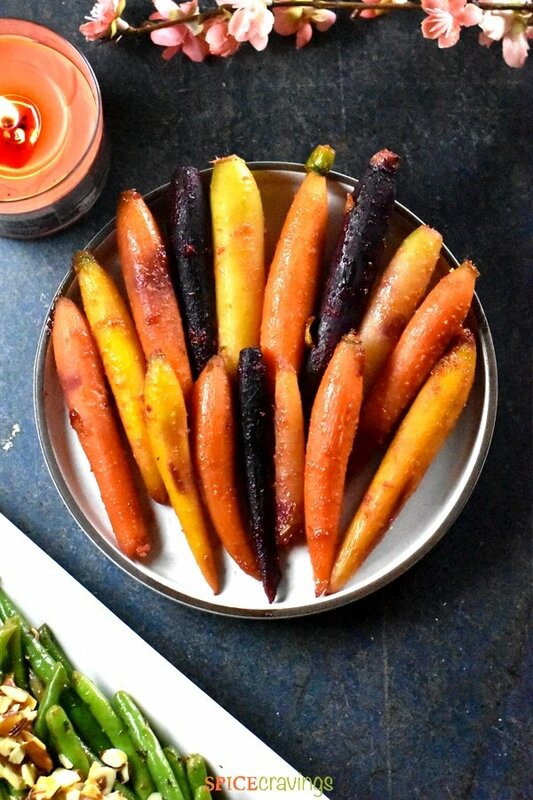 Baby carrots, baby rainbow carrots, heirloom carrots, or like in this recipe, petite rainbow carrots. 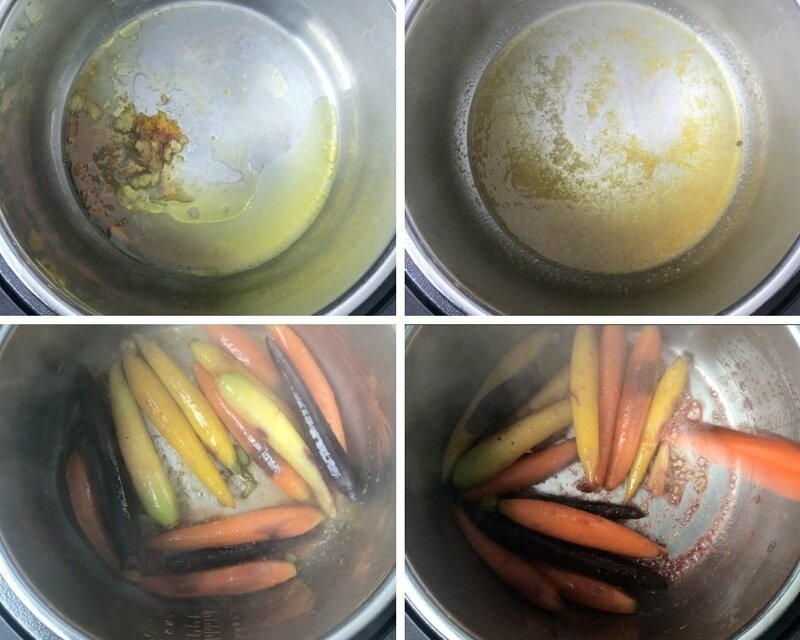 In this recipe, I steam the petite carrots for 1 minute in my electric pressure cooker. If you are using baby carrots, reduce that steam time to ‘0’ minutes. If you are using regular whole carrots without chopping, increase the steam time to ‘1-2’ minutes, depending on how thick the stem is. The saute to glaze the cooked carrots remains the same. When I bought my electric pressure cooker, Instant Pot, I never thought I’ll be using it to steam vegetables. I always thought pressure cooking veggies will turn them to baby food. But then, I experimented with cook times and settings and realized that I can get a pretty consistent crisp texture by using the right settings. ✭ Pour water in the inner pot. Place a steamer basket or the trivet that comes with the cooker. For baby carrots, I prefer the steamer basket. For regular or petite carrots, I line the carrots on top of the trivet. I close the lid and set ‘Steam’ or ‘Pressure cook” mode for 1-minute. ✭ As soon as the cooker beeps, I manually release pressure (QR), by turning the vent to ‘Venting’ position in the DUO, and pressing down the pressure release button in the ULTRA. 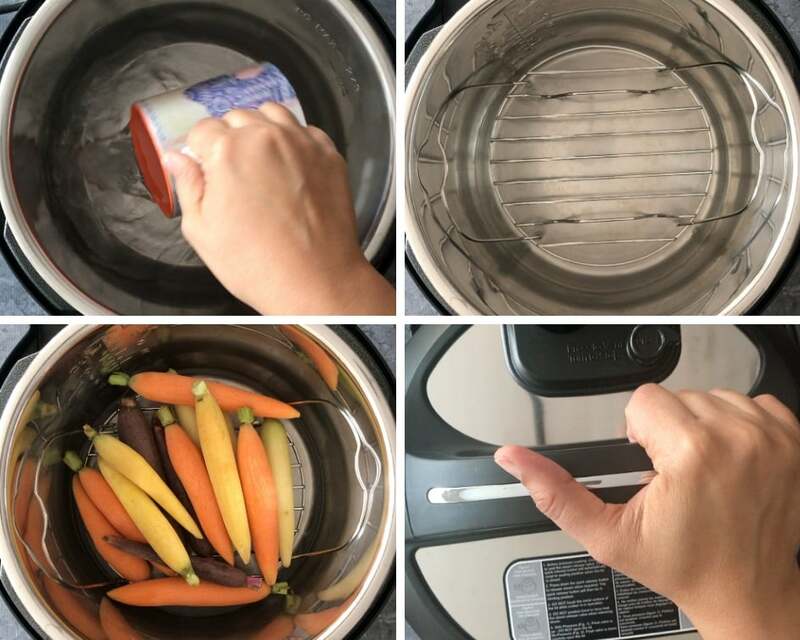 Remove the carrots and discard the water. Depending on the size and type of your carrots, use the instructions above and steam your carrots. Remove the carrots and discard the water. 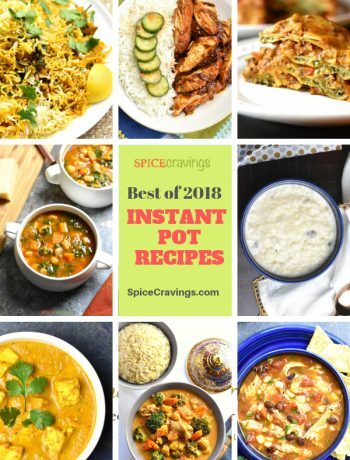 Wipe the Instant Pot dry. Turn on Saute mode on normal/medium setting. Add butter or olive oil, orange juice (or water), orange zest, honey or maple syrup, ground ginger and a pinch of salt. Add the carrots and saute till the liquid turns into a glaze and coats the carrots. ✭ Heat a wide skillet on medium-high heat. Add butter or olive oil and saute the carrots for 1-minute. Add 1/2 cup water and bring it to a boil. Cover the pan and steam the carrots for about 8-10 minutes, or until they are tender. ✭ By this time the water should have dried up, if not, saute for a few minutes and dry it. Add orange juice (or water), orange zest, honey or maple syrup, ground ginger and a pinch of salt. Saute the carrots till the liquid thickens and turns into a glaze, and coats the carrots. 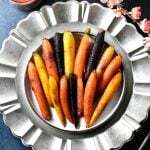 These crisp, tender and citrusy sweet Honey Glazed Carrots are a delicious and colorful side, fit for any occasion. This recipe is quick and easy to elevate weeknight dinners, and elegant enough to compliment any festive occasion. Pour water in the inner pot. Place a steamer basket or a trivet. Place the carrots on that. Close the lid and set ‘Steam’ or ‘Pressure cook” mode for 1-minute. As soon as the cooker beeps, manually release pressure (QR), by turning the vent to ‘Venting’ position in the DUO, and pressing down the pressure release button in the ULTRA. Remove the carrots and discard the water. Wipe the Instant Pot dry. Turn on Saute mode on normal/medium setting. Add olive oil, orange juice, orange zest, honey, ground ginger and a pinch of salt. 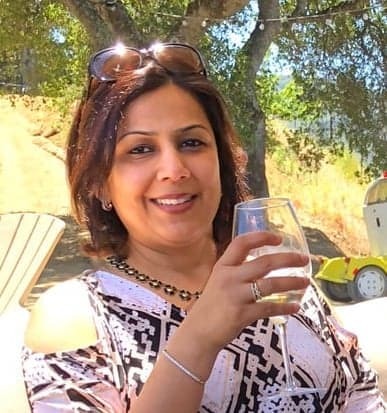 Let is start bubbling. Add the carrots and saute till the liquid turns into a glaze and coats the carrots. Heat a wide skillet on medium-high heat. Add butter or olive oil and saute the carrots for 1-minute. Add 1/2 cup water and bring it to a boil. 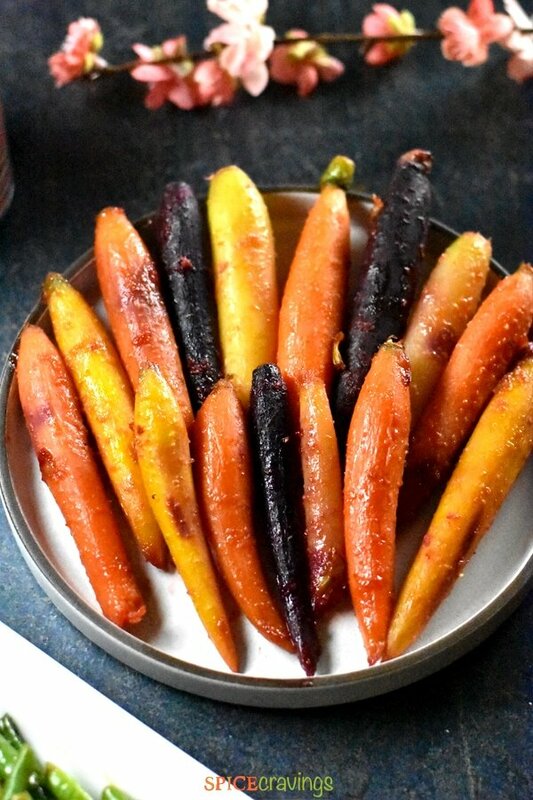 Cover the pan and steam the carrots for about 8-10 minutes, or until they are tender. By this time the water should have dried up, if not, saute for a few minutes and dry it. Add orange juice (or water), orange zest, honey or maple syrup, ground ginger and a pinch of salt. Saute the carrots till the liquid thickens and turns into a glaze, and coats the carrots.